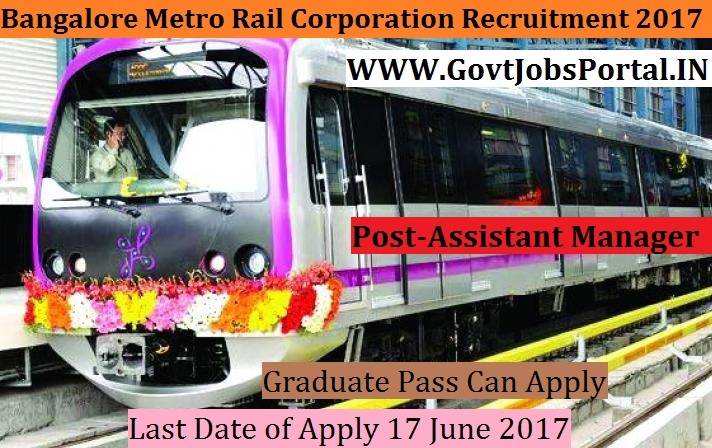 Bangalore Metro Rail Corporation is going to recruit fresher candidates in India for Assistant Manager & Executive Assistants Posts. So, those candidates who are willing to work with this organization they May apply for this post. Last Date of Apply 17-June-2017. Total numbers of vacancies are 12 Posts. Only those candidates are eligible who have passed B Com/B.B.A./BCA /BBM from a recognized university full time with Accounts as one of the subjects or Any Degree from a recognized university full time with CA / ICWA (Inter) or M Com / MBA (Finance) from a recognized university full time. Indian citizen having age in between 18 to 40 years can apply for this Bangalore Metro Rail Corporation Recruitment 2017. Educational Criteria: Only those candidates are eligible who have passed B Com/B.B.A./BCA /BBM from a recognized university full time with Accounts as one of the subjects or Any Degree from a recognized university full time with CA / ICWA (Inter) or M Com / MBA (Finance) from a recognized university full time.